Celebrating the worst singer ever? At first glance, "Souvenir" may appear to be a simple comedy about an eccentric socialite who loves to sing, even though she can't carry a tune. But Danbury actress Priscilla Squires said the play, based on the life of Florence Foster Jenkins, is actually quite provocative. "It gets to people's experiences and love of art, and why people like performing," Squires said. "The biggest question for Florence, who was absolutely devoted to her art and loved music, was all about the voice she heard in her head. "It may not have been the voice that other people heard. It makes you think: If you're a bad singer, should you not find joy in performing?" Squires, who plays Jenkins in the TheatreWorks New Milford production of the show, said she brought pleasure to other people. And as word of Jenkins' terrible singing spread, so did her fame. "They were entertained by her concerts, which she did primarily to benefit charities," Squires said. "The final concert that she did, which we show a part of in the second act, was a benefit for the Armed Forces. She did it at Carnegie Hall. It was 1944. She died about a month later." The so-called singer, who believed herself to be a great soprano, was a wealthy woman who was popular primarily in the '30s and '40s. "She was kind of like a reality television star before there was television," Squires said. "You know how you tune in to `American Idol' and watch, and some of the people who audition are train wrecks, but you keep watching? People were mesmerized by her and amused by her." Even the iffy singers on "American Idol" are passionate about what they're doing. "I think (the screeners) let some of those people through for entertainment value," she said. "In Florence's case, she loved music and it was an escape for her." 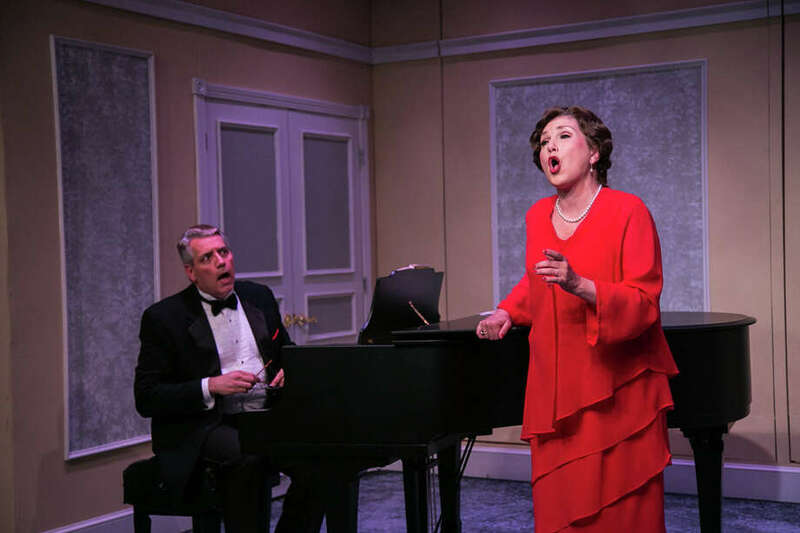 Actress Judy Kaye originated the role of Florence Foster Jenkins, first off-Broadway and then on, in Stephen Temperley's "Souvenir" and drew raves for her humorous, yet touching work. Squires has played this role before. Her partner on stage in the family-friendly production is Stamford actor Greg Chrzczon, who portrays Florence's loyal music director, Cosme McMoon. The story is told through his eyes. McMoon was Florence's musical director from 1932 through 1944. A longtime actress and talented singer, Squires said the difficult part of playing Jenkins is trying to sing a bit off-key. "I sing parts of many well-known pieces in the play," she said. "I listened to actual recordings of what they were supposed to sound like. There are recordings of (Jenkins) all over YouTube. She sings off-key, but there are times when she's close to the note; she is kissing the note but not quite on it. That was a challenge for me." TheatreWorks New Milford, 5 Brookside Ave., through May 23, 8 p.m. Fridays and Saturdays, 2 p.m. May 10, 17, $23, students and military personnel with ID $18, 860-350-6863, theatreworks.us.